I wanted to say thanks to Amber for inviting me to be a part of her Tuesday Tips. I have to admit, I'm a new reader to her blog and I'm so happy to have found A Little Bit Biased! My space over looks the play area in the basement. I've got a row of cabinets to hold fabric... most of my stash is in the center cabinet with the frosted glass doors. 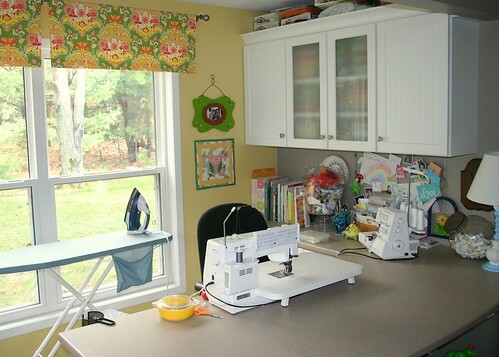 I keep my serger and sewing machine set up and ready to go. I find it really helpful to have the ironing board right behind my chair. That way I can just turn around and press a seam quickly. Here's a view to the left. This is where I have my rotary cutting mat and rulers. The white shelf holds all sorts of ribbons, Perle cotton, glitter, pincushions and a few little decorative items that are special to me. I also set my rotary cutter up on the shelf... I've had problems with little hands getting a hold of scissors and cutting fabric before, so I've learned to keep them up high and out of reach! My work area is usually pretty clean. I find that when I'm organized and there's not a huge mess... then I can focus on a project and finish it up. Now, for the rest of the playroom... there's toys all over... but at least I have an area that's cleaned up! 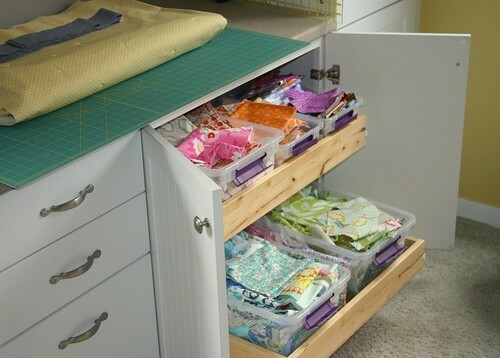 ;) The picture above is of my scrap fabric storage. I think it's about time for a scrap quilt! And here's how I store all my thread. I have a couple of clear storage boxes where the spools are sorted by color order. I hope you've enjoyed seeing a little bit of how I organize and store things! Please visit with me at twin fibers if you'd like to see what I've been sewing. Jessica, thanks so much for coming today! I love your set up (so clean and organized and pretty!) 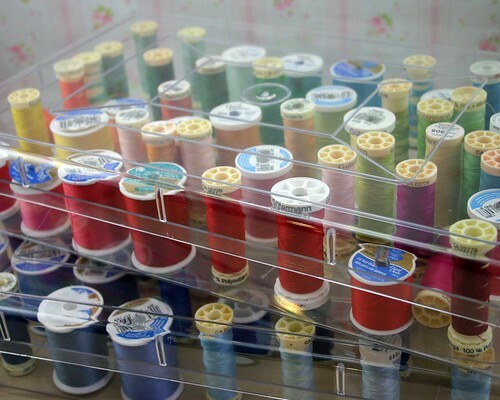 I need to move my ironing board closer to me and get me some of those clear containers for thread! Just perfect!!! Please feel free to leave Jessica a comment below. I hope you enjoyed this installment of Tuesday Tips and have a great day! It looks like such a pleasant place to be creative. Now that's a wonderful room. So lovely! And that tiny version of cogs & wheels pattern is darn cute. 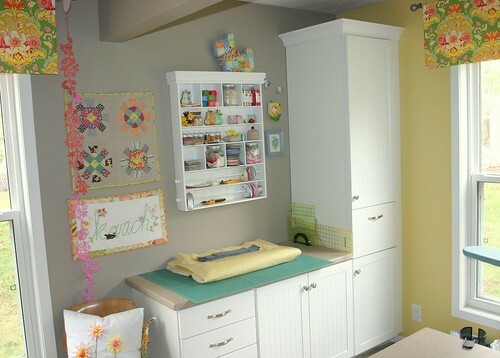 Now that's a sewing corner! Love it!